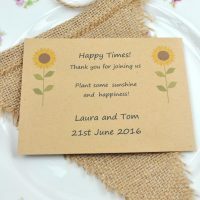 Categories: Personalised Seed Packet Wedding Favours, Recycled Manilla Packets. This boho wedding favour seed packet is right on trend with its antlers design, and also a rather quirky and useful wedding favour! The seed packet measures 9 x 12 cm and are made from quality recycled paper. 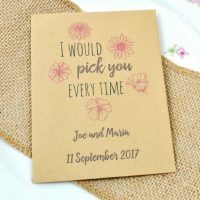 The packet is personalised with your wedding details and contains wild Poppy seeds or wildflower seeds for butterflies and bees (Cornflower, Corn Marigold, Corn Marigold and Poppy) – please choose from the drop-down box above. Please also advise your wedding details in the personalisation box above. Poppy seeds are very tiny and you will get thousands in a packet! With regard to the wildflower seeds, you will get around a gram of seeds. Poppy seeds germinate easily and often lay dormant in undistrubed ground for years until the soil is distrubed. Sprinkle the seeds on to a lightly rtaked bare patch of soil if full sun. Press the seeds into the soil and water.